Today laptops and notebooks are a necessity for work and school. But what about carrying them around in your daily commute? You don't want your notebook to get scratched or damaged! What you need is a light weight and durable neoprene sleeve case. This sleek black & red case will protect your notebook against shock, scratches, dust and damages. The flip design makes it easy to slide in a briefcase or backpack, and means no zippers scratching your notebook. 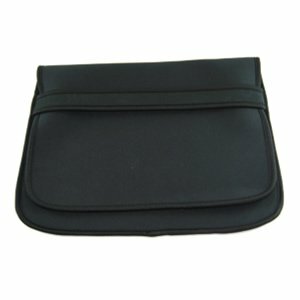 The stretchable neoprene material fits most 16" x 12.25" Dell, HP, Compaq, IBM, Toshiba, Sony, Apple®, Gateway, Acer, and Sharp laptops. Case size: 16" x 12.25"
I would highly recommend this to anyone with a 17 inch laptop! I have a 17" Toshiba and was having a hard time finding a bag or a sleeve to fit it. I even took my laptop to Best Buy to try things out and the bags (shoulder or backpack) were either ginormous or didn't fit, and the sleeves were not easy to use. This sleeve is PERFECT- nice and snug, I don't have to worry about zippers scratching the laptop or breaking. It does have a bit of a smell to it but it will fade- definitely NOT a reason to not buy this! Hope this review helps you make a decision! I bought this to protect my 17 inch Macbook Pro. It works great. The price was perfect. Far more affordable that other similar products. Was shipped promptly. Highly recommend. First of all this thing fits my 17" widescreen gateway p-7811fx laptop perfectly. The catch is, it smells bad, like burn plastic or something similar.